How do you choose between nearly identical modular kayaks? Water sports continue to gain popularity; this coupled with thrill seekers who are into kayaking has seen an increase in demand for modular kayaks. With demand comes manufacturers who are bent on cashing in, leading to the production of many models, each promising to perform above the rest. 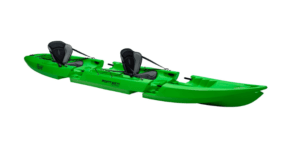 Modular kayaks are those type of kayaks which can be taken apart and put together in seconds. They can go from solo to tandem by adding an extra midsection piece and even multi-person by adding as many midsections as needed. Most modular kayaks are being used for recreational purposes, fishing and touring. Amongst the most popular brands, we will mention Tequila! GTX (recreational kayak), Martini GTX (recreational kayak), Mercury GTX (touring kayak), Tequila! GTX Angler (fishing kayak) – from Point 65 Sweden and Snap-On Top, Scout from Snap Kayaks USA. Are you in need of an upgrade or in the market for your first modular kayak? Whatever your reason is for buying one, there are some consideration to getting the best kayak within your budget. To help you in this, we have reviewed some of the best modular kayaks. We have delved into different types of modular kayaks including solo, tandem, sit-on and sit-in versions. We have reviewed each model based on the recommended purpose like fishing, weekend trips, and sports. Additionally, we have covered pros and cons based on functionality features such as stability, maneuverability, speed, and tracking. The Tequila! GTX solo version is one of the fastest on the market, being designed for high maneuverability and stability. It fares well against in-wind conditions and is excellently on in-waves. It comes with a capacity of 265 pounds, making it one of the high-capacity solo kayaks out there. Colors available: red, blue, yellow, lime. Read the full review of Tequila! GTX Solo. Perfect for: recreational activity, fishing, day trip. In tandem mode, the Tequila! GTX kayak is a sit-on-top model with high maneuverability and stability. It weighs a total of 77 pounds with a capacity of 530 pounds. The model provides high speeds, tracking, and excellent in-wind workability. Colors available: red, blue, yellow/orange, lime, yellow. Read the full review of Tequila! GTX Tandem. In the kayaking world, Point 65 is among the leading brands. The prestige comes from the production of competitive models, and the Tequila! GTX sit-on-top modular kayak is no different. This kayak from Magnus de Brito’s designs is both versatile and high-performance. It’s perfect for beginner, normal and expert-level users. The model can be used on various water bodies including rivers, lakes and open waters. Also, it can be used for competitions or recreational activities such as fishing. With small, normal and large paddlers as part of the design, Tequila! GTX is suitable for both adults and kids. 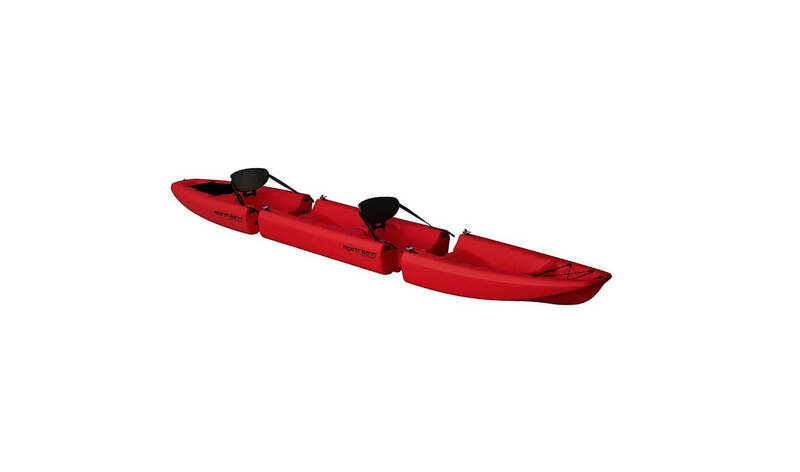 This is a sit-on-top model with easy maneuverability plus a Snap-Tap modular system, making it easy to convert from solo to 2-piece or even 3 piece kayak in seconds. Another selling point for this modular kayak is the inclusion of a tracking keel, which allows you to paddle straight with every stroke. It’s also important to note that the model is rigid and comfortable. The Tequila! GTX has been the target of enthusiasts who wish to break the Tandem record, which currently stands at 100-man. This kind of popularity has led this Point 65 model to winning several awards including the coveted “ISPO Brandnew” award. In a nutshell, the model is safe, stable, easy to use, transport and store. It also comes with ergonomic features such as a molded-in bottle holder and an air seat with adjustable backrest. That said, this modular kayak is not recommended for touring, surfing, or expeditions. In solo mode it measures 10’5″, with an aft section of 5’9″, with the stern section measuring 4’8″. It can handle up to 530 lbs –those are two average adult weights. It is lightweight and only weighs 77 pounds. The cockpit is roomy and quite comfortable. The cockpit measures about 33″ x 18″ and can be spray-covered to ensure continued dryness in rough waters. Colors available: red, blue, yellow. Read the full review of Martini GTX Solo. Perfect for: touring, adventure, fishing. As a full tandem, the total length is 13’8″. This Martini GTX has a patented ‘snap to’ design for modularity. This means that a midsection can be added with ease making it a 2-piece kayak. The design works for group excursions as each member can carry their own piece. It is a bit slow but handles very well in flat water. Colors available: red, blue, yellow/orange, lime, yellow. Read the full review of Martini GTX Tandem. The Martini GTX is one of the best multipurpose kayaks out there. 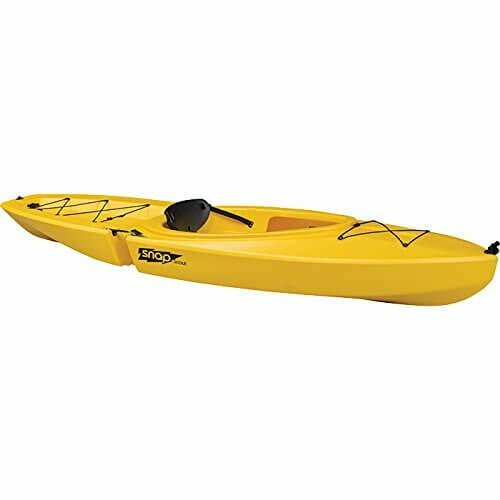 It is marketed by its makers as a high-quality kayak that will offer you versatility, good performance, and portability. Are you a novice to kayaking? Are you planning to go fishing or enjoy a ride with your family? This should definitely be your first choice. It is very spacious and can carry supplies and necessary gear. It comes with an air seat which is flexible plus a backrest for great comfort. Its seat covers are very durable. Moreover, it has exit foot braces for proper leg support. When it comes to speed, it is fast. Its mid-width of 27.6 helps it achieve a bullet shape which acts as a speed boost. The body is made of UV-resistant polyethylene, ensuring that it can withstand damage in those hot sunny days in the summer. It contains a paddle park compartment and allows for use of both single blade and double blade paddles. Furthermore, the model has an in-built rudder to help in directional support. One of its imperfections is less durability. Since it’s a kayak with various pieces it is bound to have dents and scratches hence fast wear due to the attaching and detaching process. This vessel is also wide, making it slow in the water. Another problem is that a paddle is not part of the supplied equipment. In solo form, it is a very lightweight watercraft (only 40 lbs in weight). The reason is its parts are made with minimal designs to avoid unnecessary clutter. Its solo length is 8’10’’ with a width of about 24.2”. Its stability in water is proven by the amount of weight it can handle in water, which is 220 lbs (100 kg.). Colors available: red. Read the full review of Apollo Solo. Perfect for: recreation or fishing on rivers or lakes. To use it as a tandem you will have to add another piece –each comes with a seat and a foldable backrest. The tandem length is 12’9’’ and the width is 24.2″ and can handle 485 lbs carrying capacity. It’s also easy to handle and stable in water. In this mode it can be used for both recreation and fishing. Colors available: red. Read the full review of Apollo Tandem. This is a basic sit on top (Open cockpit) kayak that has proved to be perfect for beginners and intermediate users. 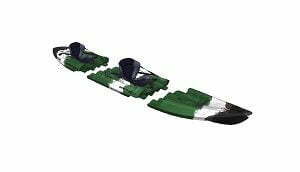 Having been created with modular designs in mind, it offers amazing fun and versatility while guaranteeing stability and maneuverability in water. 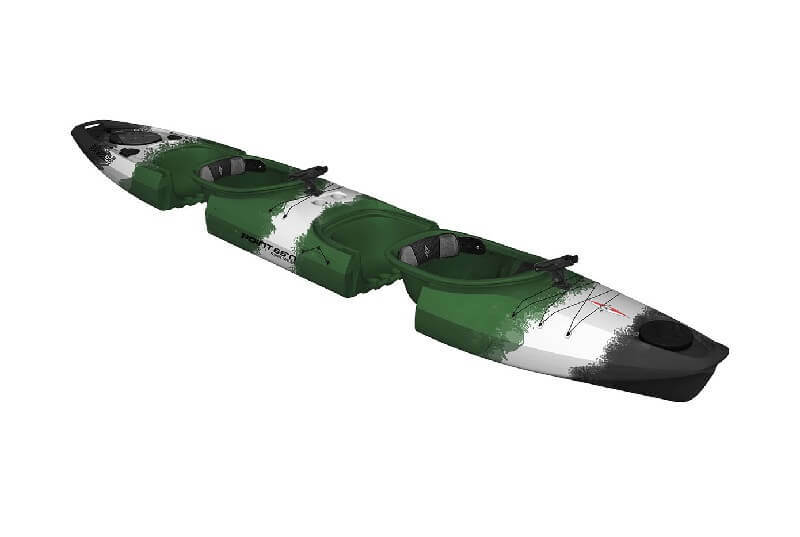 This take-apart kayak comes with a maximum of 3 pieces each measuring 55 inches. However, it can be extended with additional pieces to your desired length. It is also an easy to carry and store vessel. Additionally, it is made from polyethylene plastic hence very durable. The Apollo has plenty of leg room, a comfortable seat and contoured foot braces for increased paddling comfort. It features a tank well as a storage solution for keeping your items dry. When it comes to forming vs. function, it’s well balanced in aesthetics compared to its intended purpose. One of its selling features is that it has a molded-in bottle holder. Top-notch stability is ensured by a hollow hull shaped bottom. Some of its cons include unfamiliar design, making it unpopular for some kayakers Also it is only available in one color and doesn’t have a rudder. Finally, its unique features make it only suitable for niche buyers and collectors. It’s easy to assemble and manage. However, it’s not very fast which can be attributed to the intended use- fishing. When it comes to maneuverability, the model proves king compared to the tandem. The initial stability and end stability when is use is very impressive. As a solo, it remains steady and wonderfully withstands waves. It gets even better; it has a tracking keel to enable straight navigation. Read the full review of Tequila! GTX Angler Solo. Planning to go fishing with your friend? The Tequila! GTX Angler can easily be converted to a tandem. The addition of a second mid-section makes more room for carrying fishing gear or an additional paddle. For example, each mid-section is equipped with additional rod mounts. Simply put, the mode is reliable and high-performance. Colors available: green cammo, yellow/orange. Read the full review of Tequila! GTX Angler Tandem. This is an easy to use watercraft for most anglers; it is one of the best fishing kayaks ever made by Point 65. It has all the necessary accessories needed to make your fishing trip fun and effective. The GTX Angler comes with three paddles- sizes small, normal and large. Its convenience comes from the ability to easily carry and store. It’s also versatile enough for use by both beginners and experts. This kayak is recommended for exercises and day trip. It works well in lakes, rivers, and open waters when going fishing. However, it is not recommended for expeditions, family trips or even surfing. As a trend in Point 65 products, the Tequila! GTX Angler is made of ultra-durable and UV-resistant recyclable polythene. The quality of this material helps it withstand color fade, a common problem encounters by anglers venturing in salty waters. Its AIR seats are among the most comfy in the industry, ensuring anglers withstand long fishing rides. In addition, it is fitted with pneumatically adjustable backrest, for improving comfort. Its Snap-Tap modular system enables for easy switching from between solo and tandem modes. Here is a very useful video to watch about this kayak. The solo version comes as two pieces. Its deck has mounts that enable the addition of more rod holders or other equipment needed by an angler. For a dry ride, you can use spray paint on the deck and around the cockpit. The cockpit is quite spacious and comfortable with dimensions of 33 by 18 inches allowing for easy entry and exit. The model supports snapping in a mid-section to transform it from a solo vessel into a two piece kayak. All sections are equipped with several rod holders. Two of these are flush-mounted just behind the seat, while one is located on deck mount just in front of the paddler –it is removable and replaceable. Martini branded products are very versatile and this model is no different. 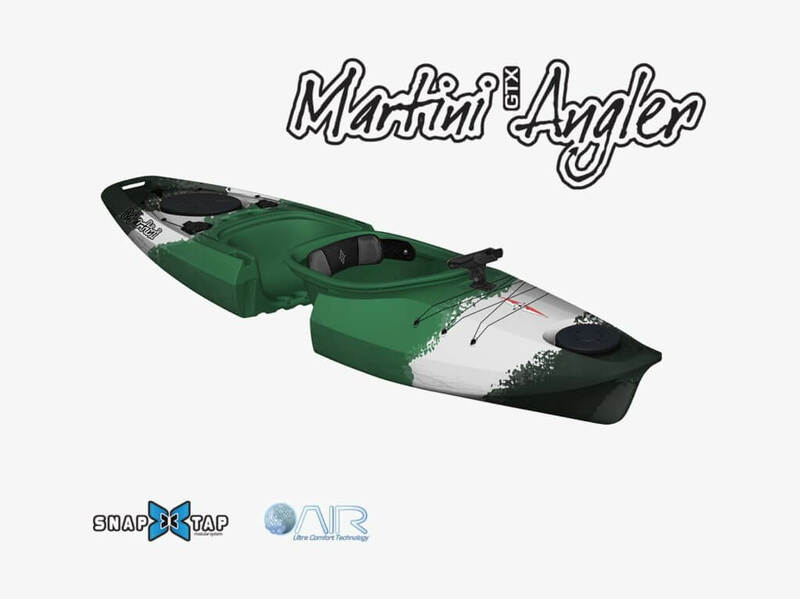 The Martini GTX Angler is a decked kayak with a flat shaped hull and comes recommended for fishing. Designed with modularity in mind, it’s one of the most unique sit-in fishing kayaks. It is easy to use when fishing and when storing afterward. It has a length of 9′ 4”, a width 27.6″, and weighs 48 pounds. Its size allows it to handle up 265 pounds. The vessel is perfect for beginner and intermediate anglers as its features are a confidence booster to anyone. Similar to the non-fishing Martini GTX, its body is also made of resistance polythene plastic. Although it comes recommended for fishing and hunting, you can also use it for other recreation purposes. It has two dry stern hatches, a perfect storage solution for your fishing gear. On the side of this vessel is a fish-o-meter for measuring your fish or other catches. It also has AIR seats with a backrest to ensure that your fishing trip doesn’t end with back pains and cramps. When used by a solo angler its speed serves those who hunt unprotected inshore waters. However, this doesn’t mean it can’t fish in offshore waters. Its carrying capacity is 100kg/220 lbs, giving you enough room for your haul. As a tandem, this kayak is designed in such a way that each piece will fit together seamlessly. The tongue and the groove system can be used to fit the parts, while the protruding pieces are fitted into the brackets. 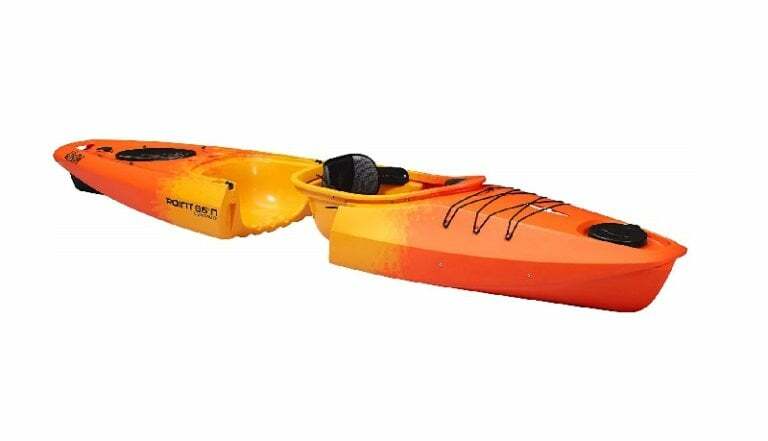 The aptly named Snap Kayak is manufactured in the United States, specifically Syracuse, NY. It a stable sit-on-top kayak made for high performance and can be used as a solo tandem vessel. As with most modern kayaks, it has a modular design that makes it easy to assemble and disassemble for easy carrying and transportation. It also comes with a foldable backrest, a welcome for those going with a partner. Other outstanding features of the model include contoured foot braces and a cup holder. This vessel comes with three pieces, a front section measuring measures 69” x 30”, middle section measuring 67″ x 30 “, and a back section of 38”x 30”. Fully assembled, it measures 14.5 feet in length. Its design includes a built-in carry handle, paddle pack and bottle holders. It also has a gear storage compartment with drainage. This storage can be split apart if separate storage of items is required. As earlier noted the vessel is 14.5 feet long, giving it a longer waterline length compared to other kayaks in its category. This, however, comes with a set of disadvantages, including being less manageable and difficult to maneuver in rough waters. That said, the long waterline length makes Snap Kayak be very fast. Furthermore, its 30” width is comparably narrow giving it a reduced wetted surface area- another speed-boosting feature. Additionally, the wide midsection gives the model great secondary stability. The design takes into consideration the interrelation of parts to ensure that different sections do not affect speed and stability. That said, the model is mainly designed for calm waters hence should be used in rough waters. Another downside is that its design does not include rod holders. When used for a solo ride, the front section has a length of 5’9’’ while the stern section is 3´2” long, this eventually makes it 8’8’’ long while maintaining the 30’’ width. It has a comfortable seat as well and a backrest like most of the kayaks reviewed here. As a tandem, it Snaps apart and re-assembles in seconds. Its small sections make it super easy to store and transport. However, scalability is supported if you want more paddlers. Tandem measurements are 14’2’’ in length and a width of 30”. For those wishing to use it as a tandem, the mid-section can be added to the Snap Scout Kayak to achieve this. It’s is crafted using durable, blow-molded HTP polyethylene. The material is not an easy victim of tear or damage from extreme weather conditions and scratches. Kayaks are mostly rated by quality, with creators having a rigid, high-performance design in mind and this model does not disappoint; it’s a high-quality vessel with comfortable seat plus a backrest to ensure a comfy ride. Also, its hull shape happens to be very unique and provides amazing stability. Some of the model’s limitations include lacking proper drainage – no drain plug. Even when flipped upside down the water doesn’t drain well and you have to use a towel to dry it for transportation in your car back. 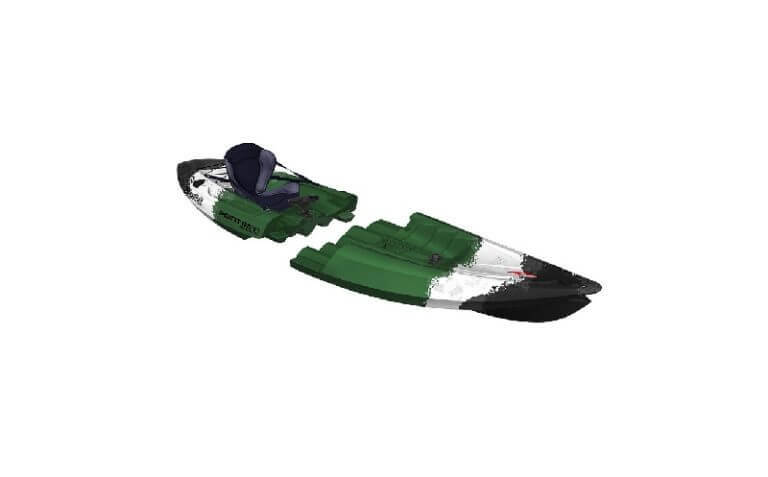 Modular kayaks are those designed in a way that you can easily take apart and join the parts. This is done in very little time and doesn’t require technical tools. The kayak comes in 3 separate sections. 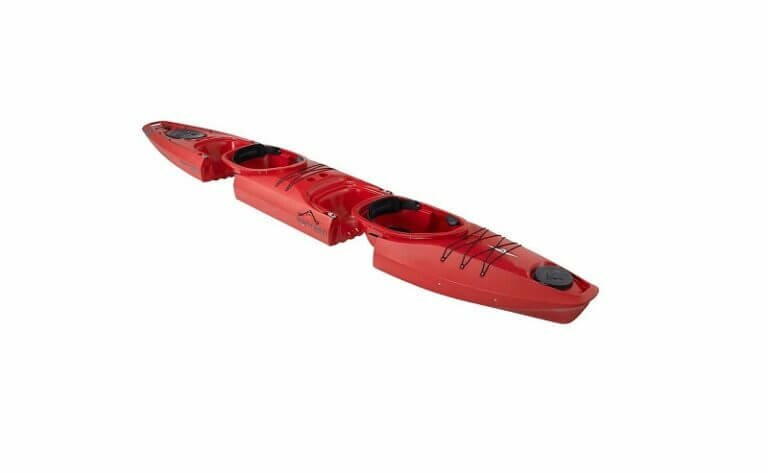 These sections allow you to easily snap the pieces together in order to create a solo, 2 piece, 3 piece or multi-person kayak. The sections are the front, a mid-section, and a back section. When buying a solo modular kayak though, it will have two pieces. For the tandem mode, you have two acquire the mid-section. The sections fit perfectly like Lego blocks giving you a chance to join as many mid-sections as you wish. 1. Weight capacity – A very important factor is the weight capacity of the kayak. This is the sum total of the paddler’s weight and additional gear weight- including the catch for anglers. As a rule of thumb do not get one whose weight you exceed. 2. Length and width – The speed, trajectory, stability, and ease of maneuverability are greatly influenced by the length and width of the kayak. For a fast vessel, get one that is long and narrow. If you are looking for stability and one that turns easily, go for a wide short model – best for beginners If you are looking for a touring kayak that can be used in big rivers, large lakes and withstand large waves, go for one that is at least 14-18 feet long. 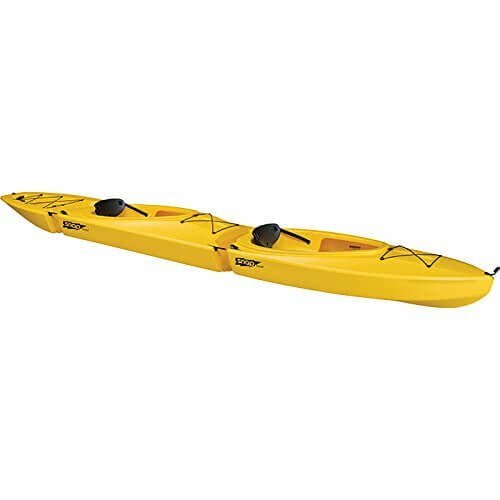 If your desire is a good recreation kayak that can navigate through narrow inlets and passageways, you should go for one that is at least 8-15 feet in length. This is the ideal length for calm waters such as small lakes, creeks, and rivers. 3. Sit-in vs. Sit-on-top – This is another major feature of modular kayaks that will help you when narrowing down your choice. Here are the highlights of each design. 4. The hull type – The hull design is the shape of the bottom of the vessel. 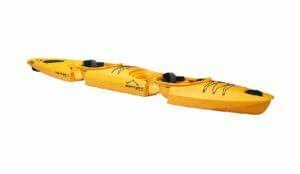 It influences the primary stability (Initial stability when stepping in) and the secondary stability (Stability when paddling) as well as the performance of the kayak. Rounded Hull – This hull greatly increases speed and allows for easier travel. They give the kayak more secondary stability and more maneuverability. V-Shaped Hull – These hulls have the least amount of primary stability but their secondary stability is top notch. They easily cut through the water and are good when you want to maintain a straight line. They are recommended for long distance touring and recreational activities. Flat Hull – These are the best hulls for great primary stability and easy maneuverability. Best for beginners going for recreational paddling. Pontoon – This hull type combines the primary stability of Flat hulls and the Rounded hull’s secondary stability- very stable but also very slow. 5. The kayak body material – It is wise to look for a kayak made with durable material. The material should be able to withstand harsh UV- rays and salty water without fading. A kayak made from low-quality material will fade fast, meaning the plastic’s strength and ability to remain watertight will get compromised. Plastic – Most modular kayaks are made of plastic. Polyethylene (plastic) makes kayaks to have better resistance against water, a longer shelf life, and to be less affected by the impact. The material is lightweight hence easy to carry. However, plastic warps in hot weather but its conformability features enable the kayak to mold back to the original shape. It’s also worth noting that the material can be harder to repair. Thermoformed ABS – This is a combination of acrylic and ABS plastic. It is more expensive than plastic but very conformable and durable. Unlike plastic which doesn’t work well in a hot climate, thermoformed ABS does. It has excellent UV-resistant qualities. Soft Shell Kayaks – These are the least popular and they feature cloth-like materials. The choice of material helps them to resist abrasions and punctures. They are easy to maneuver especially by children. 6. Extras – For a kayak meant for fishing, it is important to consider the extra gear and features that come with it. An angler will need to look for one that has rod holders, a fish 0- meter, and GPS Mounts. For recreational kayaks, you can look for those that come with paddles since most come without. Other accessories you need to consider include the type of foot braces, cup holders, storage, seats, pedals, fins, skeg (an extension of the keel for stability), backrest and rudders. Why to Use a Modular Kayak? The reason why you should consider using a kayak is shown by the large number of advantages that clearly outweigh the cons. How to Use a Modular Kayak? Most of the modular kayaks utilize the same patented snap tap technology for attaching and detaching the pieces. The front piece is designed in a way that it easily slots into the back piece or a mid-section. Each midsection can easily slot into the front and back piece or even another midsection. When each of the three pieces clicks into place, they are held together by a ratchet strap locking system which is then tightened. The modular designs have been created to ensure you find this process easy; it only takes a few minutes to attach and detach the kayak. When to Use a Modular Kayak? When you want to involve your family in kayaking. The midsections can be added to accommodate a baby or an extra paddler. Another use is fishing. Fishing requires carrying gear which requires extra space. Designers have made this easier for you by providing the ‘Angler’ models. This is suited for fishing- extra spacious plus rod handles. How to Carry the Pieces? Some of the biggest worries by people new to kayaking relate to lifting, loading and carrying their kayaks. Questions like can I carry a kayak alone? Will I be able to load it onto my car? This is especially so for women. So how do you go about this? When carrying different pieces it will be easy as they can be divided among the members present. The weight is equally distributed in the midsections, only the front, and the back parts vary. When you achieve comfort with the kayak resting on your thighs, use your right hand to grasp the other side of the cockpit rim. Alternatively, dragging can be used if you have a strong plastic boat. However, note this method is not recommended as it can damage your vessel. Just hold the toggle or grab-loop handhold at the bottom of your kayak and pull it. Never drag composite or fiberglass made kayak, their hulls are fragile and will be easily damaged. These are two-wheeled carrying equipment specifically made to accommodate the kayak’s design. These are suitable if there is a long distance between the car and the water body. The ground needs to be even though, not rocky. Kayak carts are foldable and their assembling and disassembly is quite easy. An inflatable kayak is one that is filled with air and comes with an electric pump or a manual one. This without a doubt makes it one of the most portable and easy one to use. Most of them are 15 feet long, and are made of PVC-coated polyester with rigid frames. These are kayaks that are customized to roll easily. They usually measure up to 10 feet. 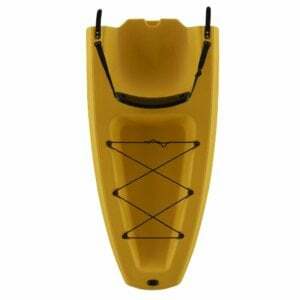 They have a rounded bottom hence they aren’t as easy to maneuver like traditional kayaks. They are convenient for white water kayaking. This is a kayak specifically designed for surfing. It surfs by catching and gliding on waves. To boost its surfing abilities, it features a sturdier rocker and a longer board. 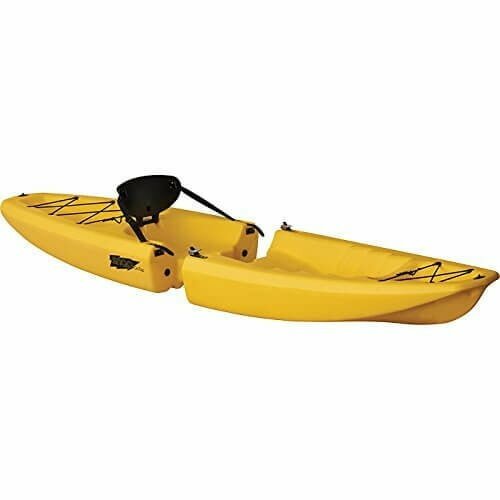 This one is similar to an inflatable kayak and very easy to use. It is convenient, space friendly and very portable. Upon disassembly, it easily fits in a backpack size bag. It is better than an inflatable kayak since you get more storage space as a well as a rugged frame. The frame is made up of tough aluminum for better durability. Q: Why does my kayak bend? A: Most kayaks are flexible so bending shouldn’t surprise you. Composite body and plastic body ones are the main ones that do so. However, skin-on-frame kayaks bend a lot more than these. When it comes to modular kayaks each section is usually stiff but when the full kayak is joined it will bend when lifted from the sides. You will also notice that the gap between the sections underneath the kayak always opens a little. This happens when interlocking moldings lock tighter together and the ends are lifted. Q: Why is there a small gap when I join my modular kayak? A: This gap should never be a worry. Because modular kayaks can be taken apart into convenient sections, they have at least a joint. The join always opens when you lift the vessel from any end, but when you sit on the kayak in water your force locks the kayak sections together and they become very tight. Q: Will this gap allow water into the kayak? A: Most of the modular kayaks have watertight sections. When these sectioned are joined, water will freely move around inside the gap that exists between the sections. However, it won’t come in. There is no need for an extra watertight seal between the sections. Q: Why do some modular kayaks require gaskets? A: Some models use bolts to join bulkhead to bulkhead. The bolts are designed to go through the bulkheads. This means that they need an effective gasket to prevent water leakage through the bolts. To make this seal not leak in water, the bolts must also be well tightened. A: These straps don’t need to be strained more than the recommendation as they only act as a final lock. The strength and rigidity of an assembled kayak comes from the interlocking shapes. Q: How tightly should one ratchet the straps? A: Most of these vessels have sections which have enough tolerance to enable you easily clip them together – even when they aren’t lined up perfectly for clipping. However, do not over tighten them as no movement is expected from the joint. Q: Water is leaking in through a sealed unit, what should I do? A: In a dry surface: First unscrew the drain plug and lead water out. Plug the drain, pour in water, then observe where it comes out through. A likely possible cause could be a loose fitting or a problematic drain plug. If the hull is punctured, locating the hole will be easy. It will require a plastic weld. Fix any loose fittings by tightening but be cautious to avoid overdoing it. 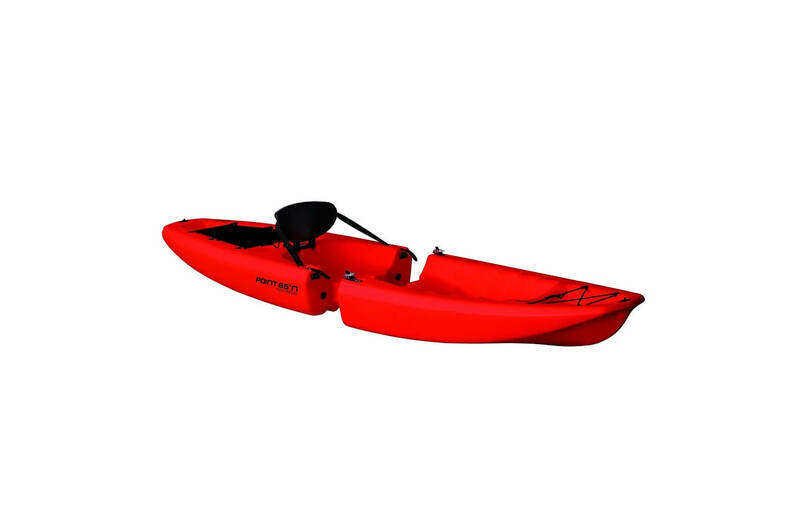 Modular kayaks come in different colors, features, designs, and specifications. They are also designed to be easily converted to tandems by the addition of midsections. So, what do you need to look for when buying one? If you are ready to buy a modular kayak, check our ultimate kayak buying guide. With the demand for modular kayaks accounting for over 80% of the market, there is no reason why you should miss out on these beautiful water vessels. Having gone through this comprehensive review, we are hoping that you found vital information for a great kayaking experience. The best part is that whether you are a novice, intermediate or expert kayaker, you can always find one that suits you perfectly and for whatever use. If you are looking for recreational and fun kayaking, we might have a solution for you. Tequila! GTX is one of the best rated modular kayaks. Touring is for paddlers who take paddling seriously and Mercury GTX is perfect for these paddlers. Excellent performance, tested and proven design. Tequila! GTX Angler is one of the most versatile sit-on-top fishing kayak. Easy to transport, excellent performance, tested and proven design. Modular Kayak Reviews is a participant in the Amazon Services LLC Associates Program, an affiliate advertising program designed to provide a means for sites to earn advertising fees by advertising and linking to (amazon.com, amazon.co.uk or endless.com, MYHABIT.com, SmallParts.com, or AmazonWireless.com).